The Vari House is located in southeastern Greece, about 4km (2.5 miles) from the coast of the Aegean sea. It sits on a rocky spur of the southernmost foothills of the Hymettus Mountain range. The site is about 18km (11 miles) southeast of Athens; and about 2km (1.2 miles) from the ancient town of Vari. The site was excavated in the summer of 1966 by British archaeologists. The excavators found no remains of other buildings nearby, no shelters for keeping large animals nor any storage facilities for grain, all items that would be expected if this structure was a typical ancient farmstead. The unusual clay jars that littered the site provided clues allowing the fieldteam to determine that the house belonged to a family of beekeepers. The building plan as excavated is a rectangle measuring about 13.7 x 17.6m (about 45' x 58'). There appear to be four rooms across the back of the building, a large central space, and two additional spaces in the front corners of the building. Each room had only one doorway, and that doorway opened only into the central space. The house itself appears to have had only one entrance, facing south, and fronted by a portico. These pages will provide information serving as a preliminary digital publication of some material concerning the Vari House, Attica, Greece (4th c. BCE). 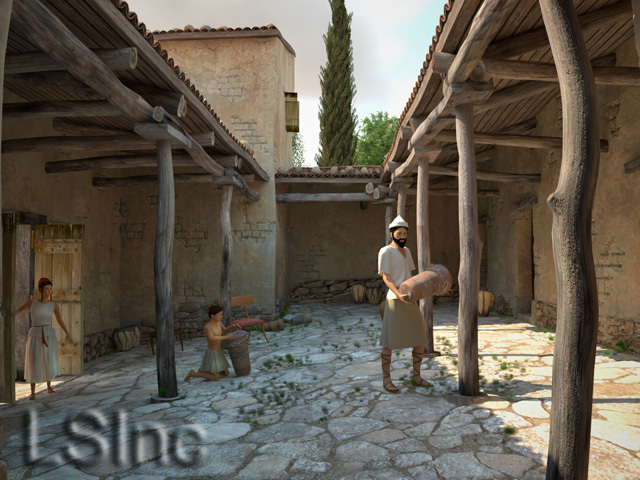 These pages are also a follow-up to the pioneering original Vari House virtual reality model and Ancient Greece: town & country interactive VR-based educational package that we produced in 1999 (and that is long overdue for a tune up; those older pages have been taken down while we prepare the new material). As a teaser, see also below for an exciting new interactive virtual reality version of the model, using the Unity game engine ! Aerial view of the farmhouse and its surroundings (hover over to enlarge). 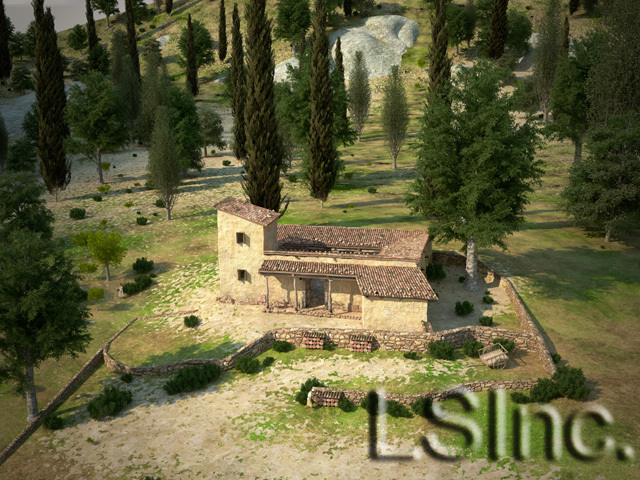 Evening rendering of the exterior of the farmhouse (hover over to enlarge). 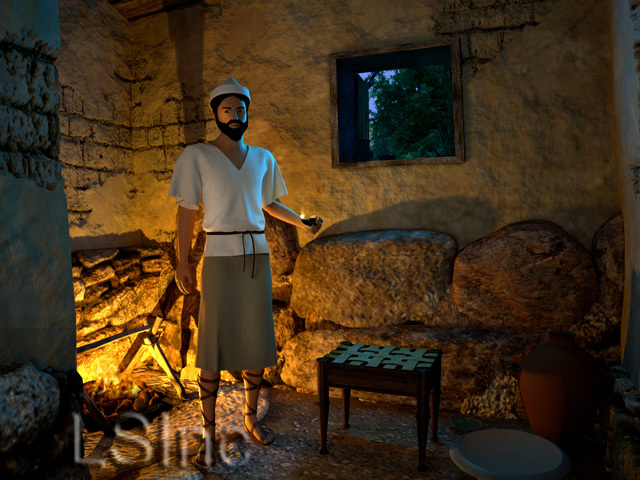 Reconstruction of the kitchen (hover over to enlarge). 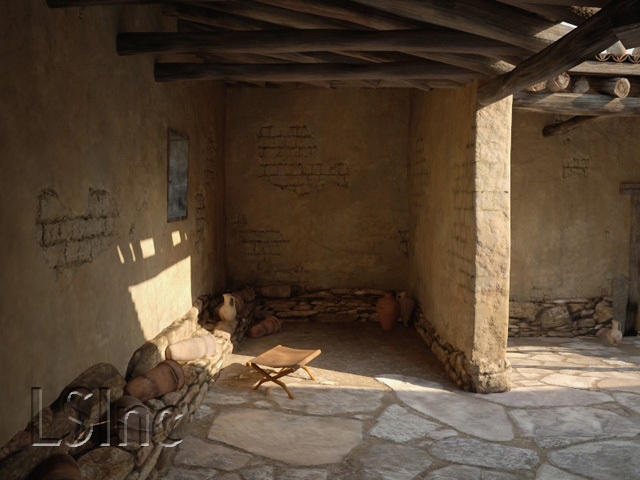 Reconstruction of the central courtyard (hover over to enlarge). 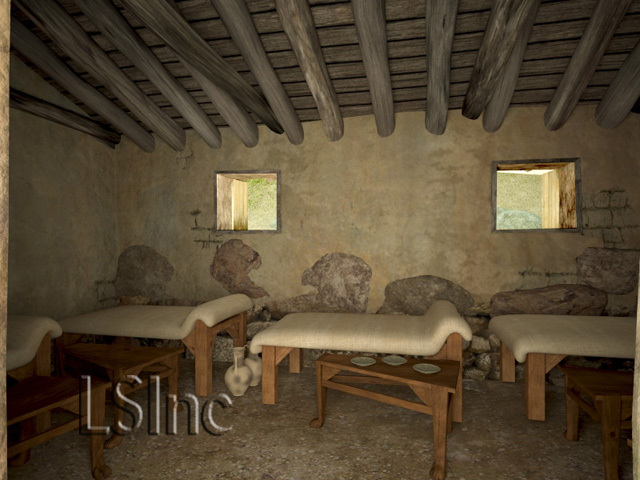 Reconstruction of the andron (men's gathering room) (hover over to enlarge). Reconstruction of the work area, off the courtyard (hover over to enlarge). Explore the Vari house in real time using the Unity game engine (prepared with the assistance and expertise of PublicVR, Boston, MA); this exciting new version of our model includes such features as: buzzing bees, wafting smoke, creaking doors, ambient music, clickable objects, and a farmer tending his beehives. 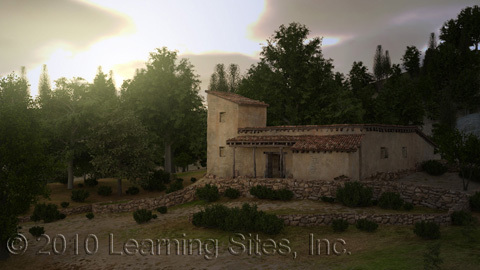 Some of the renderings from this project are now available for purchase and use in noncommercial educational contexts at the Institute for the Visualization of History Website (www.vizin.org). © 2011-2019 Learning Sites, Inc.